Dave Shelton's Good Dog bad Dog strips have been collected and released as the first book from the DFC library. 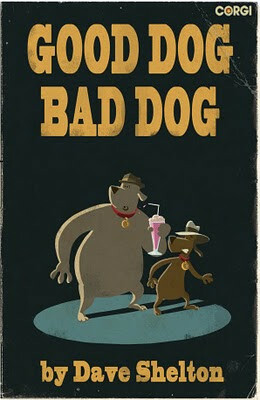 As a celebration of the book's release on World Book Day I've done my own pulp novel pastiche cover of Good Dog Bad Dog. The kind of thing you might find in a charity shop for 10p or on eBay for £30. Meanwhile Dave's book is available from all good booksellers for a reasonable price. Well... what are you waiting for?!? That's gorgeous, Rob. Thanks so much.